Today I’d like to share the results of a poll completed by the Leading Education by Advancing Digital Commission. The poll surveyed 883 parents and 812 public school K-12 teachers, and found that the vast majority of both parents and teachers “support greater use of technology in education, and believe that school systems should do more to improve access”. I was more than surprised by a few of the poll’s findings. For instance, of the teachers polled, “82 percent feel they are not receiving the necessary training to use technology to its fullest potential in the classroom”. I think it’s such a shame that percentage is so high. I also find it disappointing that the United States “is somewhat or far behind the curve when it comes to American public schools’ use of technology in education”. I guess we have to start somewhere though, so it’s polls like these that should make us open up our eyes and realize change is needed. A recent poll by the Leading Education by Advancing Digital Commission has found that the vast majority of K-12 teachers and parents support greater use of technology in education, and believe that school systems should do more to improve access. The poll, which surveyed 883 parents and 812 public K-12 teachers, determined that 96 percent of teachers and 91 percent of parents think that applying technology to teaching and learning is important to the education of American students today. More than half of both audiences also believe that technology will play a much bigger role in educating students during the next decade. Responses also indicated that the country is somewhat or far behind the curve when it comes to American public schools’ use of technology in education, especially when compared to other parts of the economy. When it comes to investing in resources for students, 89 percent of teachers and 76 percent of parents would rather spend $200 per pupil on an Internet-connected device, than $200 for new science textbooks for each student. However, teacher responses also highlighted potential problems associated with the implementation of said technology; 82 percent feel they are not receiving the necessary training to use technology to its fullest potential in the classroom. According to the poll’s results, an overwhelming percentage of both parents and teachers believe that home access to high-speed Internet provides students with a significant advantage in the classroom. On that note, low-income parents place a greater emphasis on successfully integrating technology into their children’s education, seemingly because they are less likely to have access to broadband Internet at home. Furthermore, both parties acknowledge the degree to which technology can better enable teachers to provide faster feedback to students. While the use of technology in the classroom has been on the rise across the country, low-income schools in particular have found themselves on the wrong end of the digital divide. “It’s an obstacle,” Karen Cator, director of the Office of Educational Technology in the U.S. Department of Education, said in June. “We do need to figure out ways that students, regardless of Zip code, regardless of their parents’ income level, have access” to technology inside and outside of schools. This article was found at http://www.huffingtonpost.com/2012/09/10/poll-finds-k-12-teachers-_n_1871017.html. Today I am sharing pieces of an article and an infographic that give the results of a poll that was conducted by Dell regarding technology in education. Nearly 1,600 interviews were completed with students, teachers and parents in China, Germany and the U.S. I found the results to be really interesting. Take a look! Who is using technology at school most and for what? Chinese students in major cities say they spend more time using technology in school than American and German students. In China cities, respondents say technology is integrated into more curriculum areas than in the U.S. or Germany where respondents say technology is most often used for research. Without this integration, technology in the classroom can be a distraction. According to Dell, this highlights an opportunity to more effectively and broadly integrate technology into learning in the U.S. and Germany. Are teachers knowledgeable about technology? Many teachers in the U.S. and Germany said they don’t receive enough professional development opportunities focused on technology. Their students agree. Only 40 percent of students in the U.S. and 26 percent in Germany say their teachers know how to use technology better than they do. This suggests an opportunity for increasing and improving professional development opportunities for teachers to more effectively use technology in learning in and out of the classroom. Is there a place for social media in the classroom? Social media is playing an increasing role in the classroom according to respondents. One in four students say they access social media in the classroom on a daily basis. However, most teachers in the U.S. and Germany say they never access social media in the classroom. Chinese respondents are the most positive about the prospect of using social media in the classroom. Approximately six in 10 U.S. respondents say they disapprove of students using social media in the classroom to share what they are learning, while most respondents in China say they would approve of social media for this purpose. This demonstrates a growing need to find a role for social media in learning. How is technology bridging between home, school and life? Just half of students say they interact with their school online outside of school. Most students in Germany indicate they do not interact with their school online, while a majority of Chinese students say they do. However, students report that they use technology at home for school work more than any other activity, indicating an opportunity for more collaboration between home and school. Are parents willing to pay more so their children can have access to technology? Most respondents said parents should receive stipends to ensure their children have up to date technology for educational purposes. Additionally, parents across Germany, China and the U.S. said they would be willing to pay for the technology their children use in the classroom. This information was found at http://content.dell.com/us/en/corp/d/secure/innovation-in-education.aspx. Today I’m sharing a short, but informative, article on some creative ways to use an interactive whiteboard in the classroom. I’ve experimented quite a bit with the eBeam products and I believe that the educational uses for interactive whiteboards are unlimited. However, I think that teachers sometimes feel overwhelmed by new technology for that exact reason. Interactive whiteboards have so many uses, and can provide so many unique tools, that it’s like “Where do I start?”. That’s the reason I’m sharing this article today. Maybe it will inspire someone to try something new! Explore the following tips for getting the most out of your interactive whiteboard. While these general suggestions apply to popular brands such as Prometheus and SMART, remember to consult your operator’s manual for specific instructions. Most interactive whiteboard models come with software that allows users to create presentations as well as take notes in a blank file. During an open discussion, jot down notes or key points in a blank board file, just as you would on a traditional whiteboard. Save at the end of the discussion, and you’ll have everything you’ve covered, including student contributions, all in one digital file. This is handy for many reasons. In the short term, you can publish the file to your Web site, or print it out and let students use it to prepare for a test. Either way, students who were absent get a comprehensive record of the day’s activity, and those who were in attendance have a great study tool. In the long term, the file serves as a record of the lesson that can be used with future classes. Or, compare the original file to future versions to assess the effectiveness of different discussion and presentation techniques. The beauty of interactive whiteboards is that they allow students to take control of their own learning. Most board manufacturers tout their products’ ease of use. This, combined with a tech-savvy generation of students, is the perfect recipe for hands-on learning. The multi-media aspect of the whiteboard can refresh time-tested classroom activities. Consider this lesson example: a teacher shows a film or video clip of some neutral dialogue with two different musical accompaniments, in order to illustrate how music influences whether the words are perceived as comedy or tragedy. With the whiteboard, allow the students to select the music they’d like to play behind the dialogue. Take the lesson even further by using the board’s audio recording feature—have one group of students perform the dialogue while a second group selects the music. The bottom line is that students tend to be more engaged when they are the ones using the technology. Admittedly, this tip requires some fairly advanced skills, but if you are lucky enough to work in a classroom wired with both an interactive whiteboard and clickers (student response systems), this can be a tremendous tool. Using the whiteboard, the teacher creates an interactive quiz or test. The quiz questions appear on the board, and the teacher controls them via clicker. When the teacher posts a question, kids see it on the whiteboard and student clicker simultaneously. Students then enter their answers, which are recorded. The results are tallied instantly and can be reviewed by the teacher in the form of easy-to-understand graphs. This article was found at http://www.educationworld.com/a_tech/getting-the-most-out-of-whiteboards.shtml, which is also an awesome website for teachers…. take a look! I came across this amazing article, and I just had to share it. It’s written by Dr Termit Kaur Ranjit Singh, a senior lecturer at the School of Educational Studies in Universiti Sains Malaysia (USM). She really seems to understand the overall need for technology in the classroom. Her explanations of the benefits of technology for both students and teachers goes on and on, and I believe she’s really got an amazing grasp on just how educators should use technology in the classroom. Anyway, I think it’s very well-written and informative, and I hope you’ll take a look! Like flipping on a switch in a dark room, the right use of technology in education can do wonders to produce great minds and holistic individuals. OBSERVING a trainee teacher teaching during her practicum one day, got me thinking again on how schools and teaching have hardly changed. From the time I was in school many decades ago, till this day and age where everything is going “e”, teaching has yet to embark on real change. When my trainee teacher took out her laptop, connected it to the projector, and started her PowerPoint presentation, I was glad to see how she used a simple application and made it “powerful” from the very start of her class. The students were engaged in the lesson which was conducted in a more interesting manner than the usual chalk and talk method. Effective technology integration must happen across the curriculum in ways that research shows can deepen and enhance the learning process. In particular, it must support four key components of learning: active engagement, participation in groups, frequent interaction and feedback, and connection to real-world experts. Effective technology integration is achieved when the use of technology is routine and transparent and when technology supports curricular goals. Technology changes the way teachers teach, offering educators effective ways to reach different types of learners and assess student understanding through multiple means. It also enhances the relationship between teacher and student. When technology is effectively integrated into subject areas, teachers grow into roles of adviser, content expert, and coach. Technology helps make teaching and learning more meaningful and fun. The myriad resources of the online world also provide classrooms with more interesting, diverse, and current learning materials. The Web connects students to experts in the real world and provides numerous opportunities for expressing understanding through images, sound, and text. New tech tools for visualising and modelling, especially in the sciences, offer students ways to experiment and observe phenomenon and view results in graphic ways that aid in understanding. As an added benefit, with technology tools and a project-learning approach, students are more likely to stay engaged and on task, reducing behavioural problems in the classroom. Technology is ubiquitous, touching almost every part of our lives, our communities, our homes. Yet most schools lag far behind when it comes to integrating technology into classroom learning. Many are just beginning to explore the true potential technology offers for teaching and learning. Properly used, technology will help students acquire the skills they need to survive in a complex, highly technological, knowledge-based economy. Integrating technology into classroom instruction means more than teaching basic computer skills and software programs in a separate computer class. Technology-enabled project learning is the new plus ultra of classroom instruction. Learning through projects that are equipped with technology tools allows students to be challenged intellectually, while giving them a realistic snapshot of what the modern office looks like. Through projects, students acquire and refine their analysis and problem-solving skills as they work individually and in teams to find, process, and synthesise information they have found online. Technology use in teaching and learning may also make some assessment methods redundant. Low level (factual) knowledge for example, has been traditionally tested by the use of multiple choice questions. In an ICT environment, online tests can easily be used, which instantly provide the teacher with a wide range of information associated with the learner’s score. There are various technological tools that are available in assisting teachers with this task. Comparisons of previous scores and dates of assessment, for example, will indicate a student’s progress, and each student can be allocated an individual report database stored in electronic format into which each successive test’s results can be entered automatically. This means we can make do without reports and put all information online instead. Teachers can also pick up on the creative use of Internet technology and put the blog to work in the classroom. The education blog can be a powerful and effective technology tool for students and teachers alike. The role of the teacher must change because using technology in teaching will cause certain teaching resources to become obsolete. For example, the use of overhead projectors and chalkboards may no longer be necessary if all learners have access to the same networked resource on which the teacher is presenting information. The role of the teacher must change in the sense that it is no longer sufficient for teachers merely to impart content knowledge. Instead, it is crucial for teachers to encourage critical thinking skills, promote information literacy, and nurture collaborative working practices to prepare students for a new world in which no job is guaranteed for life, and where people switch careers several times. It is our responsibility as teachers to produce holistic individuals who are ready to face the real world, a world full of challenges. Teachers must begin to reappraise the methods by which they meet children’s learning needs and match curriculum to the requirements of human thought. The Internet can be an excellent way to adapt information to meet the characteristics of human information processing. Traditional methods of imparting knowledge, such as lectures, books and this conference paper, are characterised by a linear progression of information. Human minds are more adaptable than this, using non-linear strategies for problem-solving, representation and the storage and retrieval of information. Technology encourages teachers to take on new and expanded roles, both inside and outside of the classroom. The teacher assumes the role of coach or facilitator while students work. Outside of the classroom, technology supports teacher collaboration. Instead of working in isolation, teachers can work together on school wide programmes. They can help find solutions to problems and act as peer advisors to provide information and feedback. Technology if harnessed properly can play the role of “Aladdin’s lamp” in teaching. For children with special needs, like hearing impairment, I believe you cannot proceed much in providing meaningful education without the use of technology. As for other cases also, I believe a good teacher cannot materialise his or her brilliant ideas for creating learning experiences without technology. For example, with a digital camera and the Internet it is possible to cover a wide spectrum of experiences at the global level, something which cannot be done via verbal and routine non-verbal methods and through textbooks within the walls of a classroom. One may argue that you need to have your own ideas before using technology. Though this is true to some extent, by using the Internet you can find ideas to teach certain topics and thus supplement the planning process. Thus technology can be a good servant in the planning and execution of teaching. Just have a clear vision and information on what prevalent technology can do, and its limitations. Technology as an enhancement is as important as light is to a dark room. Technology integration is not education in itself. However, technology is the light for our current times. Applied in the right way it will help in the education process to produce great minds and holistic individuals. The writer is a senior lecturer at the School of Educational Studies in Universiti Sains Malaysia (USM). Her main interest in research is in the area of ICT in Education and the use of Peer Coaching in technology integration in teaching and learning. Her most recent achievement is a Gold Medal in the Malaysian Technology Expo 2011 for creating a courseware using the SmartBoard. She is currently working on the development of an Interactive Teaching and Learning Lab in USM. This article was found at http://thestar.com.my/education/story.asp?file=/2012/7/8/education/11458494&sec=education. A teacher in the US has unveiled his amazing collection of whiteboard artwork. Gregory Euclide originally started to draw on the board at his school in Minnesota River Valley to relieve stress during his 25-minute lunch break. 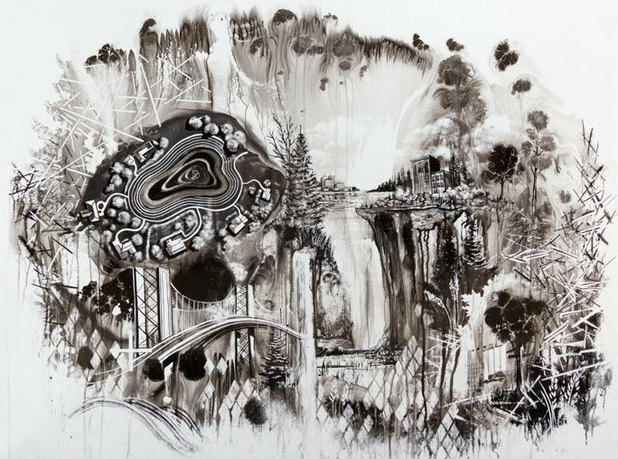 Euclide’s paintings are made from things lying around the classroom, such as whiteboard erasers, paper towels, brushes, spray bottles and Japanese Sumi ink, which is made from soot, water and glue. He said of his artwork and the student’s reaction to it: “In our culture, there is a strong emphasis on reproduction and the original seems less important. “My students were shocked when I would erase the original, because they saw it firsthand, and they were disturbed that it was destroyed. 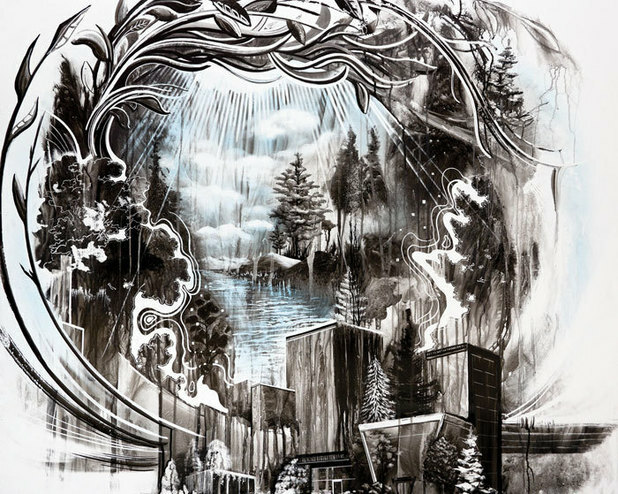 Euclide’s artwork is also on the front cover of Bon Iver’s 2012 Grammy Award-winning album. The teacher is putting together a permanent version of his artwork in a special edition of ten portfolios called Laid Down & Wiped Away. As always, if you’re looking for great eBeam prices or would just like to check out some awesome eBeam products, please check out our website, http://www.ebeamrocks.com/. Mention my blog, and receive an extra discount!